Snow days in Rome are beyond rare. I've lived here for over thirteen years and (until yesterday) in all that time it had only snowed two measly times (February 12, 2010 and February 4, 2012). I guess if it’s going to snow in Rome, it’s going to happen in February, because once again, in the early hours of 26 February 2018, the heavens dumped a dozen or so centimeters of white fluff on our lovely city. If you were in Rome during a snowstorm, where would you go first? The Pantheon, to see the snow falling through the oculus (as I did in 2010)? Or the Circus Maximus to watch gleeful Roman kiddies sled down its ancient slopes (as I did in 2012)? How about the Bioparco, Rome’s very own wildlife park? It might not be an obvious choice, but imagine how beautiful a zebra must look in a snowscape? But that brings up a concern: How do the animals, many of them designed for African or sub-continental climates, deal with all that unexpected snow? Sadly, this year the snowstorm marooned me in my neighborhood, so I did nothing more exciting than play with my toddler in the snow, and see his delighted and wondering first reaction to it. And while that was fun for both of us, it’s not something that would interest my dear bloglings. So instead, today I’m posting the photos I received this morning from Rome’s Bioparco. The glorious images by Massimiliano Di Giovanni were accompanied by assurances that the animals were well taken care of, despite the unusual weather conditions. The zookeepers weren't taking any chances when it came to the animals in their care. They prepared special high-calorie diets for certain species to help them deal with the cold, and extra attention has been paid to the tiniest monkeys in the world, the tamarins and the marmosets, to keep them nice and toasty. Heat lamps, floor heating, and other methods have also been used to keep the elephants, pygmy hippos, tapirs, and reptiles, at a safe temperature. Now that you know they are safe, you can delight in these brilliant photos. 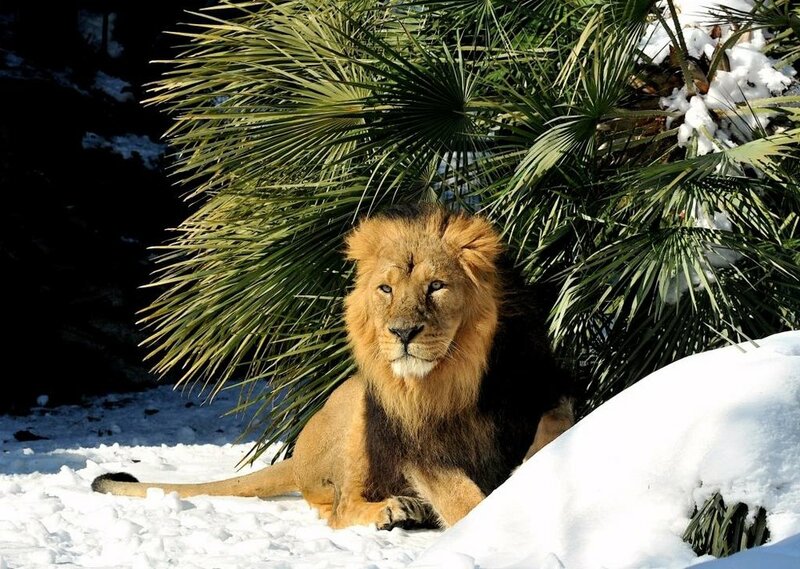 How often do you get to see lions and chimps playing in the snow?